We had an AMAZING Weekend. Brianna, who is 12 years old with Type 1/2 SMA came in from Rockford with her dad and cousin Maddizon. Unfortunately her mom was not feeling well, but we are soooooooooo happy they were still able to visit. We went to two FREE, donated ticket events (The Windy City Roller Derby and Circus in the Park) and also had a SLEEPOVER. Circus in the Parks was a Starlight Foundation event. In addition, Sophie (who is from Chicago and is 7 months old with SMA) visited with her parents and grandma. Check out my HUGE photo album and short videos of some of our FUN!!!! We have to do this more often with additional families and friends (with and without SMA). 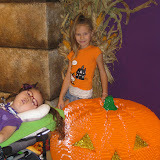 Ally is still in her full body brace/cast, but we are trying to still allow her to experience some extra FUN activities. She is off of all pain medicines and no longer needs Motrin or Tylenol either. She goes to her next orthopedic appointment November 2nd and we hope she can move into a simple hip brace that will allow her to sit again. We will have to see how the healing goes since her bones are sooooo tiny and brittle. Please continue with the prayers and well wishes. 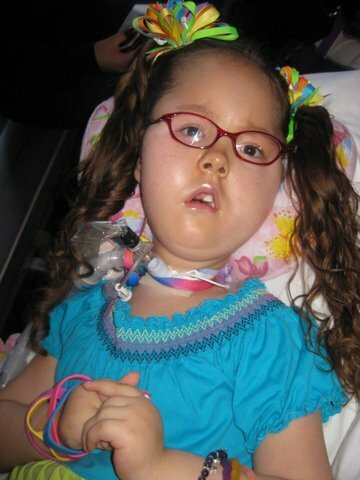 Ally continues to have homebound school 1 hour a day at home and speech once a week for an hour. In addition, she has music or art therapy from Horizon Hospice each week. 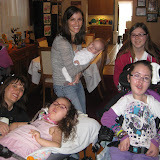 Below is an amazing Music sessions with Ms. Rachel, Ally, Melissa, and their cousins Jacob and John Jr.!!!!! Thanks again for everyone’s continued suppport! We LOVE when you leave comments or send a message. What have you been up to lately? Please consider joining the Ally’s Angels Team and/or donating to MDA in honor of Ally Krajewski. Ally has type 1 SMA and is almost 6 years old. The Chicago Muscle Walk will be held indoors at United Center on Saturday, December 10th. Registration is at 8am. Walk begins at 10am with lots of Family FUN!!! 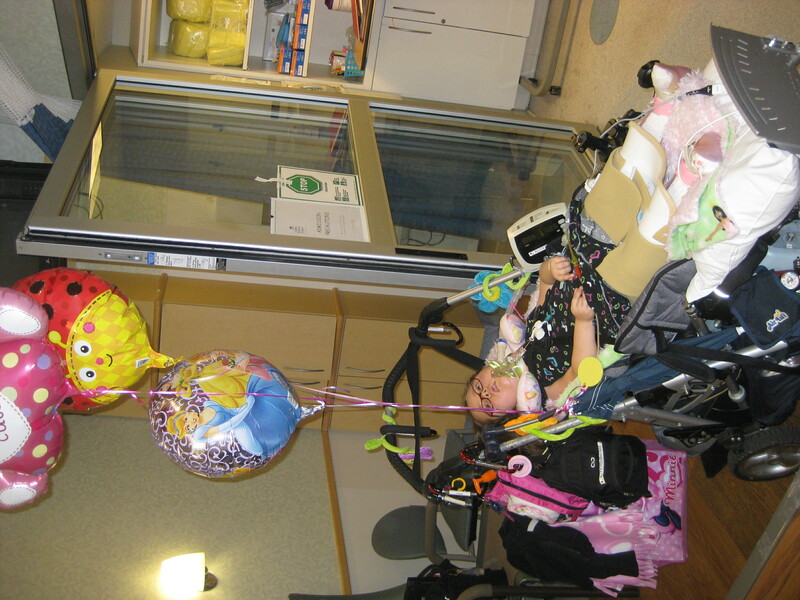 Ally is 5 ½ years old and has Spinal Muscular Atrophy (SMA Type 1) which is one of the 43 diseases MDA helps with. Ally is not able to make protein for any of her muscles due to this genetic disease, but she makes up for her muscle weakness with her bright eyes and strong brain. Although Ally can only move her head, fingers, arms and legs a little bit. She is very intelligent and learning to operate her own computer with her eyes and a tiny switch. Ally uses her computer to talk, play game, and show us what she knows. She attends Kindergarten at Hanson Park School. Ally is also beginning to drive a power chair with a very special lightweight controller. Every day with Allyson is a blessing, as she teaches everyone around her the true meaning of life, courage, love, friendship, and faith. One of our dreams for Ally is to be able to attend MDA Summer Camp when she turns 6 years old (She will be 6 this February 2nd!). Although kids with SMA Type 1 used to be given a life expectancy of 1-2 years, Ally continues to beat the odds. With your help and the MDA, I have high hopes that MDA Camp summer and so much more can become a reality for my brave and courageous Ally. Other ways MDA has helped our family is by paying for the medical costs of the clinical trial Ally participated in Stanford, CA from 6 months to about 2 1/2 years old, paying for parts of her size 1 wheelchair/stroller and offering us hope and support. MDA can also help families with flu shots, clinic appointments, camp for kids and medical equipment repairs/upgrades (which we plan to do this year). Thank you again for all your support. We hope you consider joining the Ally’s Angels Team and/or making a donation. Use the above link to make an online donation, or mail in a donation: Make all checks payable to: Muscular Dystrophy and please put my name in the Memo field. Thank you for giving our family and so many others the gift of HOPE. PSS — We are looking for sponsors (companies and/or families) to be featured on the back of our NEW Ally’s Angels t-shirt. Minimum donation of $200 (the bigger the better). Please contact Tina if you are interested at tina@angelally.com or 773-283-7211. Logos and donation needed by November 20th to guarantee to be printed on t-shirt. Checks payable to Angel Allyson Fund NFP. We had an absolute blast at the MDA Muscle Team Event at Soldier Field!!! Watch Ch 9 WGN 9 pm NEWS tonight! 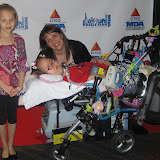 You might see me, Ally and Melissa (and RN Megan) at the MDA Muscle Event with Chicago Sports Players. Ally will be paired with the Chicago Bulls Luvabulls and the The Windy City Rollerderby Gals!!! We will help spread awareness for SMA as we work towards a CURE, treatment and support for families of SMA and the other 42 diseases covered by MDA. Just wanted to share that Ally is overall doing well. She will have her full splint/cast on till minimum Nov 2nd. Her hip bone is sooooo tiny, they wanted to give it the best chance to heal properly. This means that she has to stay flat, but we can get her out a little for some fun in her stroller/wheelchair. We are able to use regular tylenol or motrin for a little bit of pain or achiness (probably mostly from being in the spint). Ally is my HERO!!! I hope she inspires lots of people tonight too! Ally is doing homebound school right now. Miss Clare comes everyday for an hour and Miss Eileen is also able to come for 1 hour of speech each week. We really miss her kindergarten class, but healing is most important right now and we need to do as little transfers a possible, and keep her comfortable and happy. We hope to visit school for Halloween and maybe even a couple hours each week. A special thank you to ALL of her 30+ classmates who made her homemade cards and to the teachers coordinating the cards and for sending some classwork home. Ally is also very lucky to have music or art every week through Horizon Palliative Care. Be sure to see my last post and the video montage of Music Therapy with our family! 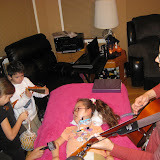 Ally and our family are super, super LUCKY to have Music Therapy with Ms. Rachel each month. Ally is part of palliative care with Horizon. It is to enrich her life and offer support (not end of life or hospice). We used to have music and art every week, but then moved to each once a month since we became more active with school as Ally has been healthier. Now that she will be more homebound because of her cast from her fractured hip repair surgery, we are able to increase to music and art each every other week. Ally really enjoys creating special art projects. She sings along in her own way during some of music therapy and her heart rate often lowers many number since she enjoys it so much. What is really amazing is when Melissa and other family members join Ally for music and art! THANK YOU HORIZON!!!! and THANK YOU Rachel and Joan!!!! 10-5-11 Ally update – Happy at HOME!!! Ally update — We got to break free from the hospital on Monday!!! Ally is VERY brave and doing well with pain (as we use some oxycodone OR tylenol). She is overall still in a good mood and enjoying her movies. She has already had music therapy in our home this week and her homebound teacher will begin tomorrow with her (will most likely skip about 2-4 weeks of school). We walked to the park yesterday to bring Melissa to Cheerleading and get some fresh air. We will keep things low key and have our first follow-up appointment with the orthopedic surgeon on 10-12-11. Wanted to update you all on Ally. Here is the latest…. Ally’s pain from surgery seems overall under control with a pain med (oxycodone) being given every 4 hours through her j tube. Orthotics came by and modified her full body splint/cast (that is only across the top of her body and padding/velcro under her). She can now be transferred short distances and she fits in her chair/stroller to go home. We are also able to lift the splint/cast to the side easier for diaper changes and to use AFOs. Ally does need to remain overall flat and be transferred as little as possible. She had a metal plate and 5 screws put in her hip and since her bones are sooooooooo tiny and brittle, we need to be extra extra cautious to allow it to heal properly. We have a little more logistics and clear orders/precautions to work out, but most likely this will all be worked out on Monday. I am hopeful (but not positive) that we will go home later in the day on Monday 10/3. We will then have a follow up with the orthopedic surgeon in about a week and might even get to simplify her splint/cast some more depending on how Ally is healing and doing. She might need to wear some form of cast/splint for around 4 weeks. Most of this time, she will spend safely in her bed or we will work out some way she can come in our living room. This may change as time goes on and as we visit the ortho department. We will not be going to school at all in the near future and hope to do homebound school with Ms. Clare. I’ll try to add some more details soon and some new pics…. including some special visitors and meeting a new SMA family today…….